The bribe money must have been sweet. From what I have read about the proposal from Qatar, it appears only parts of the upper tiers of the stadiums will be modular and recycled for developing nations. The lower tiers with the VIP suites and all will just be blown up and scrapped. If you thought there were calls for investigations into FIFA before this announcement, I'm betting there will be a pretty big stink in the next couple of years. These are projected to be the two least profitable options. I guess I'm making plans for Brasil. I'll be dead before the cup comes here. The boys at FIFA have a lot in common with another clan. [WORLD CUP 2022] There was more fallout from FIFA's decision to award Qatar the 2022 World Cup. There were new accusations of corruption with charges that $1.5 million deals were struck for the votes of two executive committee members by a sports organization working on behalf of Qatar 2022 bid committee. And German Franz Beckenbauer, a member of the executive committee, suggested that the only way to hold the World Cup in Qatar would be to hold the tournament in January and February. The latest allegations of corruption came in a report in the Sunday Times in which a former employee of the Qatar 2022 bid committee gave the Sunday Times dates, locations and names of those present at the meetings, including the executive committee members involved. “These allegations are very serious," Ivan Lewis, the British Labour Party secretary of state for culture, media and sport, said, "and FIFA now has a clear choice to launch an independent investigation with anyone found guilty thrown out of football, or face the fact that its authority as the governing body of football is no longer credible.” Lewis said he would present the evidence to FIFA. An early Sunday Times investigation led to the suspension of two executive committee members, Nigerian Amos Amadu and Tahitian Reynald Temarii. The London paper came in for heavy criticism for its sting operation from FIFA executive committee members, who were sympathetic to the plight of Amadu and Temarii. One doubts FIFA's willingness to investigate these charges reported from the same media outlet -- FIFA president Sepp Blatter is reported to have gone on about the "evils of the media" before the 2018 and 2022 votes were taken Thursday in Zurich -- though the circumstances of the cases are different. Amadu and Temarii were caught in a sting operation talking hypotheticals. In the new case, the witness was present at meetings where cash-for-votes deals were struck. This isn't the first time there have been allegations about voter fraud in a World Cup host contest. FIFA officials interviewed in the Sunday Times investigation reported about extensive payments for votes in the 2004 South Africa-Morocco race for the 2010 World Cup. On Friday, the Wall Street Journal reported that a source, believed to be the same former employee of the Qatar 2022 bid committee, said at least one adviser recommended that a payment of $78.4 million be made to the Argentine soccer federation (AFA), which was facing a financial crisis stemming from a dispute over the television contract with the Argentine league, to win the vote of AFA president Julio Grondona, FIFA's senior vice president. KAIZER'S SOLUTION. Beckenbauer told Saturday's Bild newspaper that playing the World Cup in Qatar in the winter would be a better (and cheaper) solution than air conditioning all stadiums, all the training centers and fan zones for the tournament in the summer. "In January and February, you have comfortable [77 degrees] there," said Beckenbauer, who is believed to have supported the USA following Australia's elimination after round 1 of the 2022 voting. "Qatar won the vote and deserves a fair chance as the first host from the Middle East." Beckenbauer, who headed the Germany 2006 World Cup organizing committee, is retiring from the executive committee after one term. too bad we can't post sound clips. I have a perfect clip of shoes dropping. It appears that there was an unfortunate re-occurence of that situation that required repeat attention, possibly settled in the same manner. For those of you who don't know, Grondona is the most powerful man in Argentine fútbol and is considered (with Brasilian head Texeira) in line to succeed Blatter at FIFA, who's term ends in 2013 - one year before the next Cup. Speculation is that Texeira (who was sullied in the first go-round about Russia's bid) agreed to cede the future #1 slot to Grondona in exchange for Brasil's World Cup bid. He owns a club (Independiente) and founded and has ties to another(Arsenal) and is the president of the AFA. He's the guy who hired and fired Maradona on the National Team. His family also owns (gasp) a TV network that has the Argentine league contracts. His son-in-law has a travel agency that has an exclusive contract for travel and tickets with.... that's right, the AFA. "I do not believe a Jew can ever be a referee at this level. It's hard work and, you know, Jews don't like hard work." Blatter will NE-VER oust Grondona. He and Texeira are the source of Blatter's power. 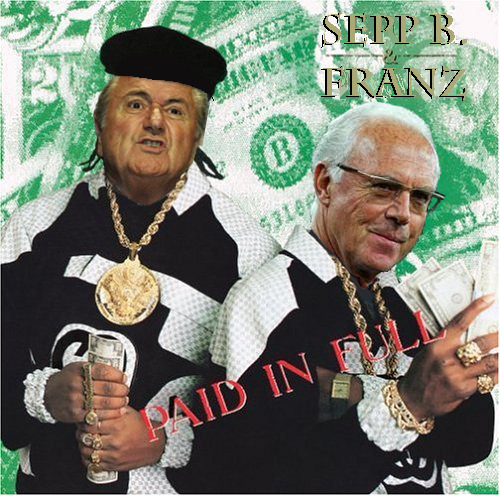 Apparently Beckenbaur has no stomach for FIFA politics. Too Bad, He could help fix the rotten mess.